Milwaukee is a beautiful city and I can’t for the life of me recall why I’ve never traveled there for a getaway weekend in the past. My husband and I really enjoyed our recent visit there! Dave and I had no idea what to expect besides beer. We were pleasantly surprised during our trip and started planning our next visit to the city while still there. We only scratched the surface during our exploration as we discovered there’s an abundance of activity to get involved in. We’re going to need several visits to really take in the history, arts, breweries, and culinary scene. Here are a few highlights from our weekend. Our visit was due to a business trip. Therefore, my husband’s company selected the hotel. We were both pleased with the choice of the Hilton in downtown Milwaukee. The hotel was built in 1927 and was originally the Schroeder hotel. It’s currently the city’s largest hotel. I was obsessed with architecture as there were so many attractive features and details! I can just imagine the lavishness of the guests who frequented the hotel in the 1920’s and 30’s. The preservation and balance between old and new are perfect! Also, the rooms were clean, spacious, and quite comfortable. Friday evening after check-in we headed out to dinner at Red Light Ramen, a local favorite in the east side neighborhood of Milwaukee. My husband was a bit skeptical when we arrived, but two of my Chicago foodie friends recommended this spot, and I trust their taste. The inside is intimate and seats 20 people at most. I enjoyed the vibe and the Hip Hop coming through the speakers whiled we dined. I even started chair dancing at one point much to Dave’s embarrassment! Whatever I gotta be me. Our server recommended that I try one of their slushies as it’s a cocktail favorite and I’m so glad that I did. It was a Bourbon slushy, and it was incredible! I wanted a second, but I could only handle one, didn’t want to be asleep under the table. My husband did order a second bowl of ramen though after happily devouring the first one. The ramen was delicious so I couldn’t blame him. I made him share some of that second bowl with me. Desiring an additional cocktail after dinner, we headed to a tiki bar named Foundation in Milwaukee’s River West neighborhood. This place was the real deal! My amazing cocktail only topped the ambiance! We relaxed as if we were on an exotic vacation. It’s a great gathering spot and on the list when we visit again. No matter where I go, I’m brunching somewhere! We decided to hit Blues Egg to fuel up. Blues Egg is known for their pulled ham that’s pickle brined 21 days and slow roasted for 12 hours, stuffed hashbrowns, and monkey bread that allows you the option get it “crunk.” Crunk Monkey bread comes with a sinfully delicious Bourbon sauce that also goes well in your coffee. Our server’s name was Peter, and he was delightful from start to finish. It’s obvious that he loves people and enjoys what he does. Peter offered to order for me. I don’t mess around with my food, but feeling adventurous, I handed him the reigns. He asked me a few questions and told me that he knew just the thing for me. Dave had the Creamy Polenta; poached eggs, roasted mushrooms, braised kale, sauce fonduta while Peter chose the Far-Flung Wrap for me: scrambled eggs, house-made turkey sausage, aged provolone, curry tortilla, sour cabbage, avocado, chili hollandaise, and mushroom stuffed hashbrowns. Although I’m not big on wraps because they’re just meh to me, the flavor of this tortilla got me. It had a slight bit of heat to it and was tasty. The sour cabbage was yummy; if it were pickled, it would’ve been kimchi. Overall, I was very happy with Peter’s choice for me and the combination of flavors. Blues Egg was my favorite meal from the weekend. In addition to the food, the atmosphere just gave me happy feelings. It could have something to do with the Motown sounds that were coming through the speakers. It just reminded me of our large family gatherings; always centered around food and music. I can’t recommend this place enough. Looking to get a bit of sightseeing in before heading to work meetings we rode over to Miller Town to peek around. Miller Brewery began in 1855 and is one of the oldest breweries in the United States. Driving along the roadway through Miller Town feels like you’re going back in time. We didn’t have enough time to do the brewery tour; it’s on the list for our next visit. I did pop in at Miller Inn, a Bavarian-style stein hall, to glance around. There’s a lot of history in there, and the interior is beautiful, with stained-glass windows, and artistic woodwork. The historic Miller Caves are located right behind the inn. The caves were dug in 1849 and were originally used to keep the beer cool. Nowaday’s the space is used to host beer pairing dinners. Seeing as Dave and I are both art lovers, we sought out a few of the cities murals. My favorite stop was in Black Cat Alley in the East Side neighborhood. 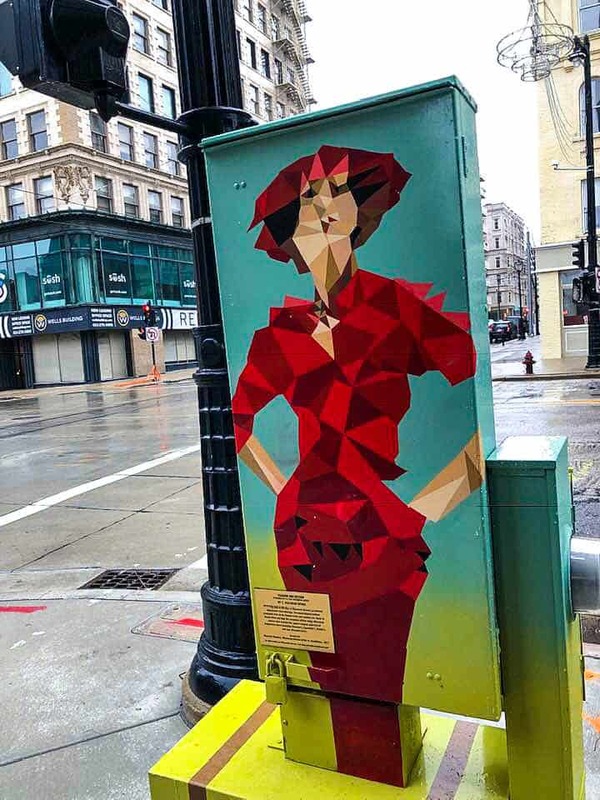 Once an empty alley, this destination is now filled with 30,000 square feet of artist’s murals, therefore, you’ll want to spend some time there admiring the work. Several times throughout the weekend Dave or I would comment how good of a time we were having in the city and wished that we could stay another day to take in more of the sights. Because we were so fascinated with the architecture in our hotel, we decided to stop and peek at another hotel in a historic building. The Hilton Garden Inn is housed in the 1846 built Loyalty building, and the staircase, details, and skylight are stunning! So much to see so little time! As much as I love beer, it was interesting that we didn’t hit up as many breweries as we could. But we did drink beer, just to be clear, lol. We just hung at the pub. We’re planning a brewery crawl for our next visit. On our way home we stopped for breakfast at Mad Rooster Cafe in West Milwaukee and it’s another culinary winner! I had the Mad Omelette, and I wasn’t mad about my choice :). Add it to the list of breakfast places to dine at during your visit. I can’t say enough about our weekend in Milwaukee, who knew! Not many! When I shared portions of our trip in my Instagram story, I received comments along the lines of “wow, I didn’t know Milwaukee was so nice!” Now you know! Tell me, have you visited Milwaukee? Where should I go next time? Inform me in the comments!